How to use Mac Task manager? 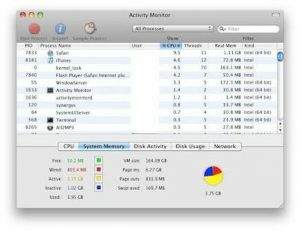 Home BLOGGING How to use Mac Task manager? The most popular among the task manager is the Windows ask Manager and the reason being the popularity of the OS and ease of use. Other than that Windows Task Manager is quite effective in helping you, manually clean up your device when it becomes slow. But nowadays people are going towards the more comfort zone and thus choosing Mac for comfort and class. As the title suggests we will be moving forward with the Mac task Manager and ways you can use it for your day to day use in your Macbook. 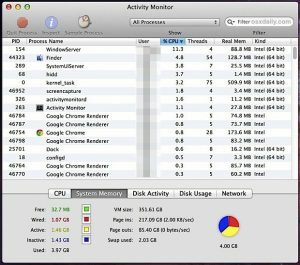 The Mac task manager is also known as the Activity Monitor as you control various activity and processes in your Mac Book with the help of it. But it is quite similar as well as quite different from the windows task manager at the same time. The activity monitor can monitor system parameters, force stop apps that got hanged, view additional info and keeping your computer neat and clean manually. In this ways mentioned you can compare it with the Windows task manager for similarity however when you try to find out the difference, there are not so many apart from the usability and interface. You will not be able to open Activity Monitor with the conventional CTRL, Alt and Delete command rather there is a different process for that. But first, let us take a look at the various features of the Activity Monitor. How can you use the Mac task Manager? Basically here we are going to look at some of the features the Mac task manager has so that you can explore it more for your day to day works. The first thing you get to see when you open the Mac task manager is a cool interface with some tabs or panes. These tabs are in the form of categories which are Memory, CPU, Disc, energy (battery) and Network. The memory tab is basically used to keep an eye on the storage system of the Computer. Through it, you can keep an eye on the RAM, its activities and how it is being used. 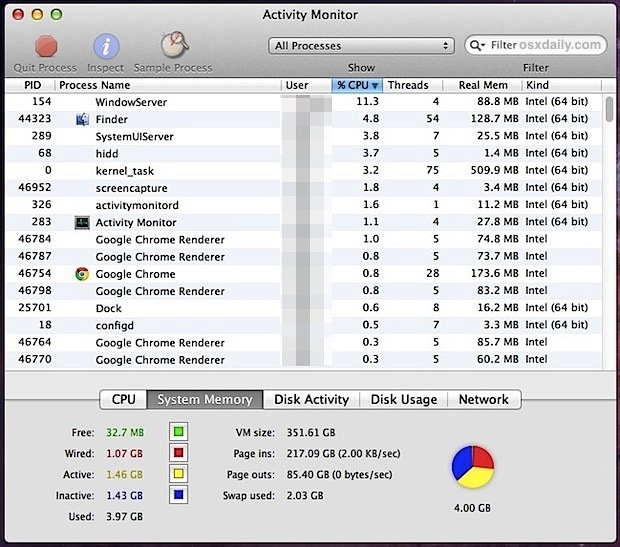 The CPU tab helps to check how much the processes are affecting the processor and its activity. The disc tab shows how much data has been read from your disc or written to your disc. The Energy pane simply keeps an eye on the battery/power consumption and also provides us the usage details. 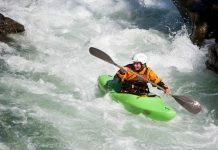 The network pane can be simply used for getting a note of the data that are sent or received by processes during a task. You can force stop applications that are not working or has stopped working. In order to do so, you need to go to activity monitor, select the application that got freeze and force close that application. You can check out additional info about the processes and applications that are currently running on your Mac book. To do so you need to go to Activity monitor and click on I button to know more about the application. You can also clean apps that are unnecessarily using RAM and Disc memory In order to keep your computer neat and clean. How to use the Activity, monitor? Remember, how we used to press the CTRL, Alt and Delete buttons to bring the task manager so that we can force stop unwanted processes? This is all the same in the Activity monitor as well, the only difference being the CTRL, Alt and Delete buttons are not used here to call it. Rather it can be launched directly. The Mac Task manager is located in the Applications>Utilities> folder location of your Mac Book. To open it you can follow the steps given below. First, you need to open the Spotlight search field and for that, you can press command and spacebar simultaneously. 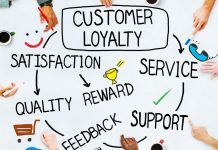 If the previous method fails then you can simply use this method as well. Go to the Finder icon in the Dock and select it. A window will appear and you will then need to choose the application pane for sidebar menu in the window. Thereafter, you need to go to the Utilities Folder. There you will find the Activity Monitor. Click on the Activity Monitor Icon next to run it. Right click on the Activity Monitor icon and choose “Keep in Dock” option to keep the application in the dock for later use. It’s like the toolbar in windows. As mentioned above few times that there are no CTRL Alt and delete option for the Mac counterpart to call the Activity Monitor. You need to visit the activity monitor first. Then you need to select the app that has been freeze and is not working. After that click on the “x” button to simply close it. 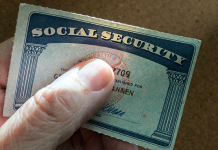 You may find a window pop up which will ask for your surety on whether you want to close the application or not. Click on agree and proceed. 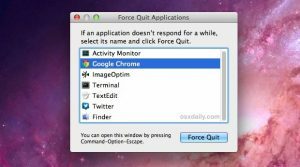 However, you can use Command, Escape and option keys on your Mac Book to call the Force Quit app manager. This will help you to easily close the unnecessary apps on your Mac book. Using Mac may be hard for the first timers and especially those who had just shifted from windows. However, there are numerous ways you can ease your work while working on a Mac book. The good news is that you will be needing the activity manager less often because the apps and the device is built far better than a device with a similar configuration on other OS. However, in case of emergency, you need to use it and thus now you can use it from the dock itself after reading this article.